Today is the day! Our first day on land! We woke up early to witness the ship’s entrance to Deception Island – one of the South Shetland Islands. We were thrilled and could hardly wait to get our feet on solid ground. We departed from our ship mid-morning with our teams via small speed boats, known as Zodiacs. It was an amazing feeling riding on the zodiac and pulling ashore. 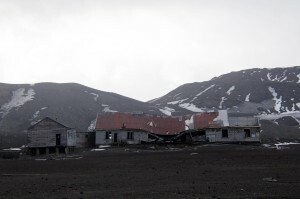 Deception Island is the site of an active volcano that had its last major eruption about 10,000 years ago. Much of the land is black/dark clay-like sand. 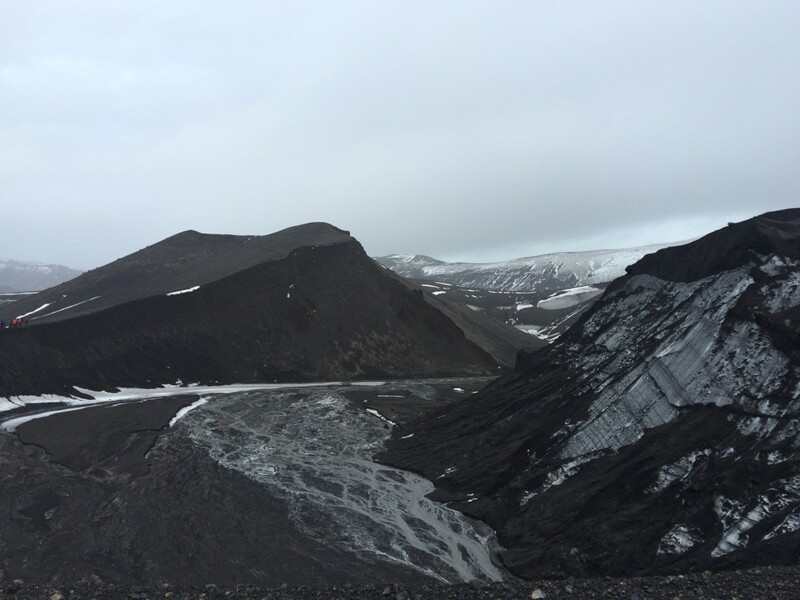 We imagine that deception island is what the moon might look like… it’s not what we expected in Antarctica! We learned that there is not as much snow and ice here, because the volcano warms the soil — our other stops will not look like this one. We hiked around the mountain as a team, and had time to reflect and write in our journals at the top of the climb. Along the way, we saw our first seals and penguins!! It was not as cold as we thought it would be – but it was VERY windy. We were putting clothing on and off—trying to find the right balance. As the 2041 team reminds us- layers, Layers, LAYERS! In order to prepare for Antarctica weather, it is important to prepare for the unexpected, because the strong winds can change without a moment’s notice! In the afternoon, we attended a lecture on the ship on Climate Change—and we received an introduction to climate change science, carbon capture, and resolutions – what we can do to change the system from the energy we have, to the energy we need to have. In the late afternoon we disembarked again, to explore Whaler’s Bay—a different landing site on the Island of Deception that used to be an active English Base (1912-1931) where Whales were captured and killed, so their blubber could be used for oil to produce energy, light and heat. The islands have a history of exploitation by sealers and whalers. Eventually rules were imposed that required whalers to use the whole whale (not just the blubber), and so they took to cooking the meat as well. We saw the remnants of this practice: the rusted and decrepit metal canisters where whalers cooked the meat and stored the oil. This practice slowed down, once Thomas Edison invented the light bulb. When the site was damaged by eruptions of the volcano in 1967 and 1969, all operations finally ceased in the region. We were deeply impacted by seeing the remains of such a horrific practice that caused so much harm to the environment and whale population. The part of the shore where we were standing at one point was a grave yard for whale carcusses. Over the years, the whale bones sunk into the clay/black sand, and were swept into the arctic waters. Now, all that is left is the remains of a ghost town to remind humanity of an unacceptable practice. On a lighter note, we fulfilled our childhood dreams and saw penguins in their natural habitat! 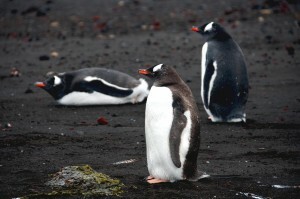 At this point in the season we can expect to see Adelie Penguins, Chinstrap Penguins, and Gentoo Penguins – no Emperor Penguins at this time of the year, but still a treat! The penguins were calm and peaceful. No fights, just companionship, swimming, caring for each other and talking to each other. They were adorable and made us really happy! 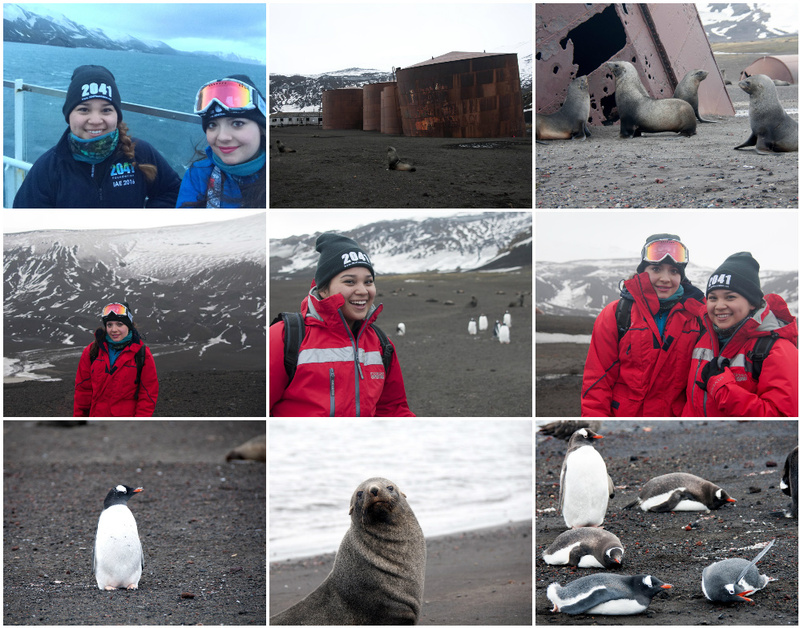 ← ANTARCTICA Post #3: We’ve Arrived!